I’ve been using the Crockpot a lot lately, mostly because I’d rather spend my time when I get home playing and running around with Bode than cooking in the kitchen. I love to cook but Bode doesn’t appreciate me taking any attention away from him. He’s always looking for my approval, which is cute and of course since I’m a working mom I will take any opportunity to spoil him with attention that I can get! Pinterest has so many great ideas for Crockpot recipes and I’ll be posting a few over the next few weeks but the one that I’d like to share first is Chicken Enchilada soup. As you may recall, I have a favorite chicken enchilada recipe I use often and I blogged about it a few months ago. But I was a little hesitant because my husband doesn’t exactly think that soup is a meal. Well this soup was definitely a meal and so delicious! Plus it made enough for lots of leftovers. I actually think it would be a perfect meal to serve for a dinner party or game night where you are sitting around chatting as you sip your soup… Enjoy! Combined melted butter and flour in a pot over medium-low heat. Stir until smooth. Remove from heat and add the chicken broth and ½ cup milk, stirring to keep smooth. Bring to a moderate boil, until it thickens. Remove from heat and add in the enchilada sauce and whisk together. Once combined, whisk in remaining milk until smooth. 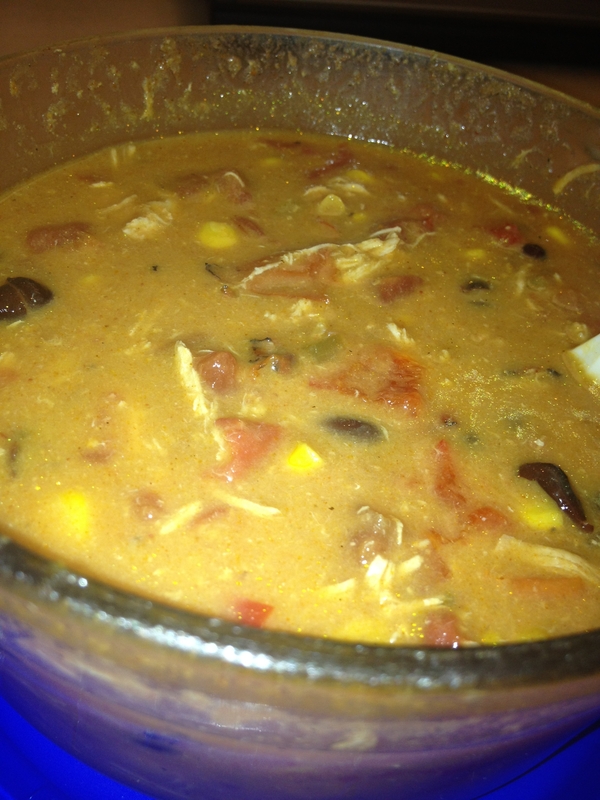 In Crockpot, combine drained beans, tomatoes, corn, onion, and bell pepper. Place the raw chicken breasts on top of the mixture. Pour sauce mixture over ingredients. Cook on low heat for 6 to 8 hours or on high for 3 to 4 hours or if you have a warm setting you can leave it in for longer (8-10 hours). When you are ready to serve, remove chicken and cut or shred into bite-sized pieces. Add chicken back into the soup, mix together. Serve with desired toppings as noted in the ingredients section (Corn tortilla strips, avocado slices, shredded Mexican cheese). Also it was already a little spicy because the enchilada sauce I use has some spice in it but you could also add some jalopenos if you prefer even more ‘kick’.